The OSHA final rule governing respirable crystalline silica calls for all covered employers to maintain a written exposure control plan. But what exactly needs to be in this plan? Who should create or update it? How should it be used? This guide will try to provide some clarification as to exactly what OSHA is looking for. First of all, why do we need this plan? What is OSHA expecting it to do? Based on this, it looks as though OSHA wants to see a systematic, centralized, updated index of steps and practices to minimize or eliminate exposure to respirable crystalline silica. In other words, your written exposure control plan is your main list of everything you’re doing onsite to protect workers from silica dust. In more detail, what exactly has to be in this written exposure control plan? Your written exposure control plan can also include anything else you think is important about keeping your employees safe from respirable crystalline silica at your worksite. Do any other requirements accompany the plan? As discussed in prior posts and in the rule itself, OSHA considers a competent person to be “an individual who is capable of identifying existing and foreseeable respirable crystalline silica hazards in the workplace and who has authorization to take prompt corrective measures to eliminate or minimize them.” According to the final rule, a competent person can also have other responsibilities set forth in other parts of the standard. In the construction scenario, do I need to put the name of my competent person (or competent people) in the written exposure control plan? No. 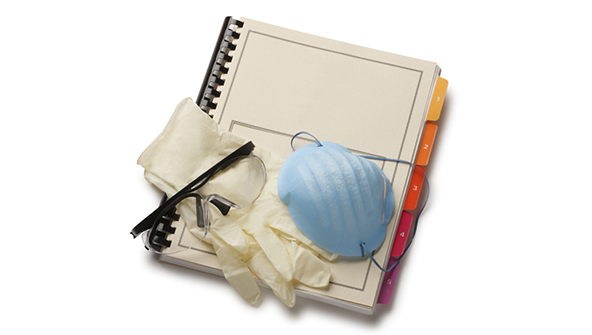 OSHA is not requiring you to give the identity of the competent person in the written exposure control plan. OSHA says this is because it expects that the person (or persons) will change frequently. What if an employee asks to read the written exposure control plan? OSHA hasn’t clarified exactly how quickly this copy needs to be made/provided, so ask yourself what an inspector might find reasonable. OSHA has also not clarified if the plan can be maintained electronically, or if only paper copies are acceptable. However, if you choose to pursue an electronic option, our suspicion is that an OSHA inspector would want to see that it is at least as available and accessible as a physical plan would be. But again, this point has not been verified by OSHA. Who should write the written exposure control plan? Can anybody do it? Do you have to be an expert on silica dust? Based on this, it is our suspicion that OSHA will want to see that the author of the plan has some sort of supervisory role. At the very least, the author should not be a new or entry-level employee. How long should I take to write this plan? Does OSHA give any indicator of how involved the process should be? I’ve heard of something called a “written access control plan.” Is that the same thing as this written exposure control plan? No. A written access control plan is a document “which describes specified methods for limiting access to high-exposure areas.” It is not required by the new rule. So don’t get confused if you hear or see this term in discussion of the final rule. While it might be a good idea to have a written plan for how you intend to limit employee access to dangerous areas, it is not required by OSHA. Are there tools in the marketplace to help me meet the requirements of the written exposure control plan? Yes. VelocityEHS cloud-based EHS management software can provide a central platform from which to manage your responsibilities and address areas that represent institutional risk. You can track and analyze employee tasks that qualify as involving exposure to respirable crystalline silica, and automated alerts can be configured to remind you when it’s time to review and update your plan. The VelocityEHS suite of solutions gives you the capability to comprehensively manage your written exposure control plan, along with all of the other reporting and EHS management tasks required to comply with the Respirable Crystalline Silica Rule.